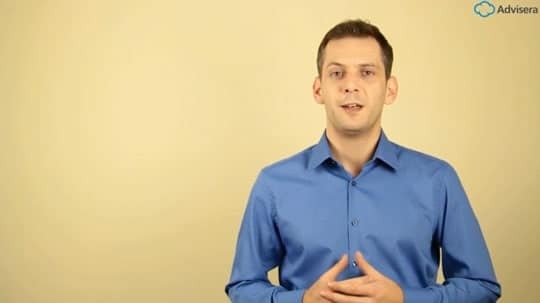 In this free online course you’ll learn everything you need to know about ISO 9001, but also how to perform an internal audit in your company. The course is made for beginners in quality management and internal auditing, and no prior knowledge is needed to take this course. If you like this course, you can go for the certification exam. The exam from this course is certified by Exemplar Global (formerly RABQSA). After passing the exam you will receive a certificate proving that you attained Quality Management System and Management System Auditing competencies. The course is organized into 8 modules, where each module has several video lectures and activities that will help you learn more quickly, as well as a practice exam that will prepare you for the certification exam – please see below for the content of each module. All the video lectures are pre-recorded, so you can take the course from anywhere, at any time for your convenience. The total course duration, including the reading of required materials, is approximately 15 hours. Materials provided in the course (video lectures, articles, and activity questions) are everything you need to successfully pass the certification exam. There is no time limit for taking the course, but it is recommended that you finish it within two weeks’ time. The access to this course and to the practice exams is completely free; the fee for the certification exam is US$ 449– after you pass the exam you’ll receive your certificate in a matter of days. After you purchase the exam, you will receive a bonus PDF containing scripts from all of the video lectures, activity questions, practice exams, and links to additional reading. The course instructor is Strahinja Stojanovic, who has rich experience with ISO 9001, but also with ISO 14001 and OHSAS 18001 as a consultant, certification auditor, and trainer. He is the author of numerous articles in the leading ISO 9001 blog, and also of the ISO 9001 Documentation Toolkit. Certificate of competence proves that you attended the eTraining course, and that you passed the exam certified by Exemplar Global (formerly RABQSA). This ensures that you understand and can apply the knowledge you gained in each of the course's modules. 1) Watch complete videos of all lectures, and answer all practice exams. 2) Pass the online certification exam. If you decide to purchase the exam you will get the PDF script from the course completely free. The script includes everything said in the videos and all activity questions as well as practice exams. This way, you can access course materials any time you like, making it much easier to practice and prepare for the exam. The training is relevant and good for beginner training for internal auditors. It does what it is designed to do. A couple of items are less than expected. The course, at least as I finished it, would only complete to 98.8%, even though all modules were completed and Next Unit selected. Module 8 Practice Exam would not update. Just a technical problem. One critique is that some of the quiz questions were “gotcha” questions, requiring the test taker to pay attention to a specific word in order to get the question correct. Testing general knowledge should be straight forward. In depth examples for the auditing modules would have been more helpful. I found it helpful and to the point. Highly recommended. Strahinjas experience, both practical and theoretical both showed here. 10/10. Would recommend to anyone requiring an easy to follow path on what could be perceived as a complicated subject. Great course on learning ISO 9001 and auditing. I was originally skeptical of this course, and figured that it couldn’t be of any help at all in obtaining the certificate. There were several modules and practice exams that I kept returning to, which I found helpful in order to help my understanding of the subject material. The exam was fairly straightforward and laid out very similar to the course, albeit the multiple choice questions only had one correct answer, not several. The exam process was simple, effective, and the course does an excellent job of preparing you for the exam. My results were returned along with certificate of completion in less than three business days. I felt that Strahinja Stojanovic’s instruction worked well, and he did an excellent job covering the subject matter. My only complaint could be that the examples given were very generic, but still very useful towards my comprehension. The course is free which is a nice bonus. I liked the pace of each module, the practice questions and the format that the training was laid out. 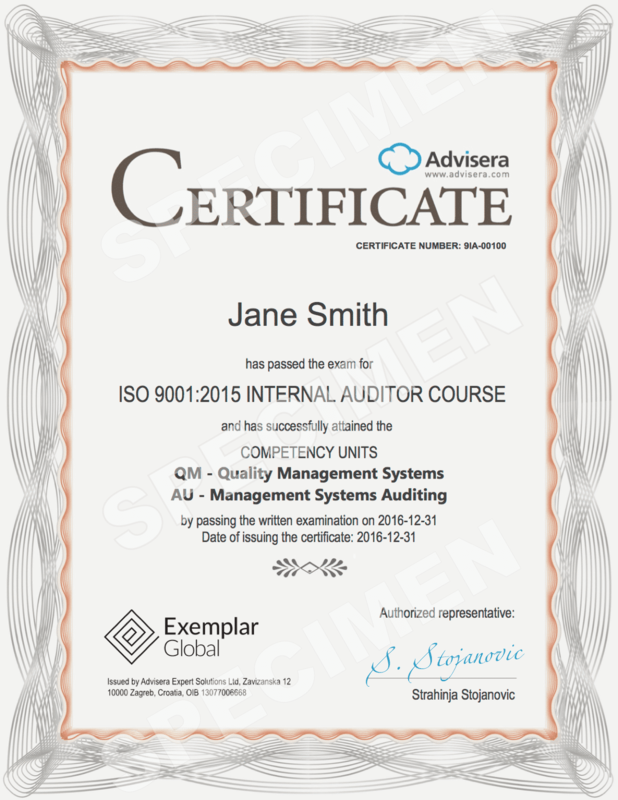 For an individual wanting to learn about ISO 9001 and the Internal Auditing aspects, this online training was terrific and highly recommended. I as well appreciated the suggested reading materials. I recommend this course for all wanting to learn more. It is a nice introduction. Pros: The course really is free and you can go back to review if you forget some of the details. I found that I could watch a couple segments, tend to my work duties and come back for more. That way I could cover one or two modules per day. I recommend the approach, it would have been overwhelming to do it all in one sitting. The instructor speaks clearly and makes an otherwise drab subject interesting. While I have fallen asleep in some ISO presentations, the speaker does a good job engaging your attention. The best activities were the ones where the student drags answers to match or where the student drags answers into the right order. That’s how the game Continuum is structured on Lumosity. I think you should have more activities like that. Cons: I think the course needs better and more frequent activities. The most common activity is a brief True-False or multiple choice quiz. Everyone is good at something, I am a good test taker. I could often answer the activity question by the way it was worded before watching the video segment. If you use multiple choice or true-false, you should have more questions. For some multiple choice questions, there are several correct choices and the student is expected to select all of them. The danger with this approach is that some of the choices are more correct than others. So you wind up selecting two of three correct answers and missing the third. This is especially galling if the third correct answer is also the least correct answer. If, instead of testing students understanding of several concepts at once, you ask more questions and deal with one concept at a time, I think you’ll get a better educational outcome. Have the website keep track of each student’s score on the test. If they fail, don’t just tell them the correct answers, make them go back and take it again. Everyone learns by doing, being asked to retake a test is a privilege rather than a burden. It also reinforces the learning. If one’s only objective were to sit through the videos I would not care about the activities. But if you, like me, really need to improve your understanding of Internal Audits, you will need more than the activities offered here. I found this course very clear and well structured. There are a lot of references to useful documentations. The quality of the videos are very good and the course instructor, Strahinja Stojanovic, is very clear in the explanations. I’m finisching my revision and as soon as possible I’ll apply for the certification exam. p.s. Even if some information are already included in this course, it would be very useful to have a course dedicate to the ISO 19011. Course content very clear and concise. Useful course but the questions are quite tricky! I am concerned that the questions are quite difficult to answer. The answer to the question may be correct but if there is a ‘more correct’ answer you get it marked as wrong. I think it would really useful to have a lot more practice questions so that you get used to the style. Thanks to devoted team! Live chat tool and messages are helpful. I personally like on-line training when you have the possibility to continue whenever you have free time. Well structured / reasons for actions are summarized. It always help not to miss tiny things to check or ask. The reason why I started this course – to get clear the message of new standard, that most of procedures and Manual are not mandatory & that with 2015 edition content of QMS docs will be reduced considerably. This is not the case. If Company will stick only to mandatory procedures and records, then auditor should rely only on interviews… and for most of findings made by auditor one can reply “I was not trained or informed”. This will be words-against-words discussion. I plan to reorganize QMS that we have for 2008, adding Context & Risk evaluation. Rising knowledge level and involvement of company staff in QMS process could be achieved by introducing people to process they are involved in and their relevant responsibilities that are summarized in writing. good class and you can go at your own pace. I like the additional documentation supplied before each session. The instructor is clear and easy to understand. I like the trial exam questions however, I agree with other comments, when you miss one multiple choice item you miss the entire question. Based on the way the question is worded, there may be some inconsistencies there. I am planning on having the entire internal auditors take this course for their recertification. Good material but needs more wow factor. Good learning material but it seems to get boring at times. Reading a bunch of articles and watching the videos could have more wow factor to keep people more interested. Also i do not like the multiple choice questions with more than one answer. This is because i may have all the answers right except 1 but it then says i am incorrect. This kind of makes me nervous to take the actual exam. Great learning material for knowing the relevant requirement of the standard very well and skills required for auditing, however you may consider separating the auditor file from the foundation file to allow easy access and navigation, any repetition the older folks say is the mother of learning. Very good, comprehensive, nicely structured course – really liked it. well structured and precisely presented. Very clear, very concise, well structured, easy to follow and understand. Once again – the way the course is split in small sections is really good. Is there a time limit for attending the course? No, you can attend the course as long as you like; however, you should try to finish it in a couple of weeks because otherwise, you won’t get enough benefits out of it. At what time can I access the course? You can access it any time – the course is a combination of recorded video lectures, quizzes, reading, and other activities, and because all those materials are readily available, you can access them at a time that is convenient for you. What prior knowledge is needed to attend the course? None. The course was made in such a way that a beginner in this topic can easily understand it. Why do I have to pay for the certificate? Well, we have to make money somehow :). We have made most of the course freely available, but to access the exam and get the certificate you’ll have to pay a fee – by the way, this fee is by far smaller than the fee for attending the classroom-type course. Additionally, when you pay for the certificate, you will be able to download a PDF scripts from all of the video lectures, activity questions, practice exams, and links to additional reading. This way, you can access the content from the course and prepare for the exam much more easily. The exam, as well as the whole course, is completely done online, from your office, your home, or any other place convenient for you. For the exam we use an online proctoring service – click here to learn more. How will I get the certificate for this course? After you finish attending the course, you can go for the exam – if you finish this exam successfully, i.e., if your score is above the minimum, then you will receive the certificate. By the way, during the exam we use an online proctoring service that will ask for proof of your identity, and make sure that you have taken the exam with no external help. Click here to learn more about online proctoring. The course is a combination of recorded video lectures, quizzes, reading, and other activities – the course takes you through all these materials in an optimal way. What do I need to access the online course? You can access the course using your PC, Mac, or mobile device, using any major browser (i.e., Chrome, Mozilla, Internet Explorer, Safari); a broadband Internet connection will also be needed. And, of course, enough time to attend the course. What materials do I need to successfully pass the exam and obtain the certificate? The materials provided in the course – recorded video lectures, quizzes, reading, and other activities – are everything you need to successfully pass the exam and obtain the certificate. The best part is: they are completely free with unlimited access! If you decide to purchase the exam, you will receive a bonus PDF containing scripts from all of the video lectures, activity questions, practice exams, and links to additional reading. This way, you can prepare for the exam much more easily.